Le Blanc® Towlewash® is an exceptional cleanser designed for all washable and colorfast bath linens. It contains properties for disinfecting in cold water while lifting tough stains caused by dirt, blood, make-up, and more. Le Blanc® Towelwash® is formulated to protect fibers from drying out, fading, or discoloring. Even after repeated washing, bath linens will remain soft, strong, and absorbent. Le Blanc® Towelwash® may be used on washable, colorfast, and organic fabrics including Egyptian cotton, silk, bamboo, modal, SUPIMA®, and more. 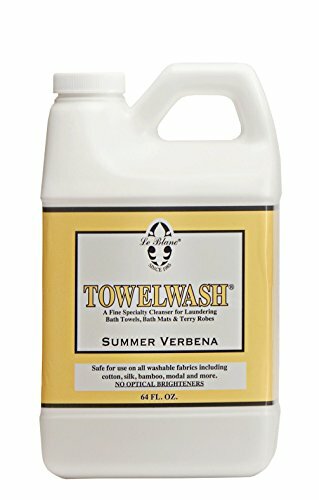 Safely launder bath towels, bath mats, terry robes, and more. Summer Verbena fragrance: soft orange blossoms, geraniums and jasmine blended with spice and orris to create an inviting, citrus scent. If you have any questions about this product by Le Blanc, contact us by completing and submitting the form below. If you are looking for a specif part number, please include it with your message.